When I was a kid, it seems like KBOX was always on in the background. Always. My father was a huge country music fan, and it was one of the (if not THE) top country stations in town. This was in the ’70s. 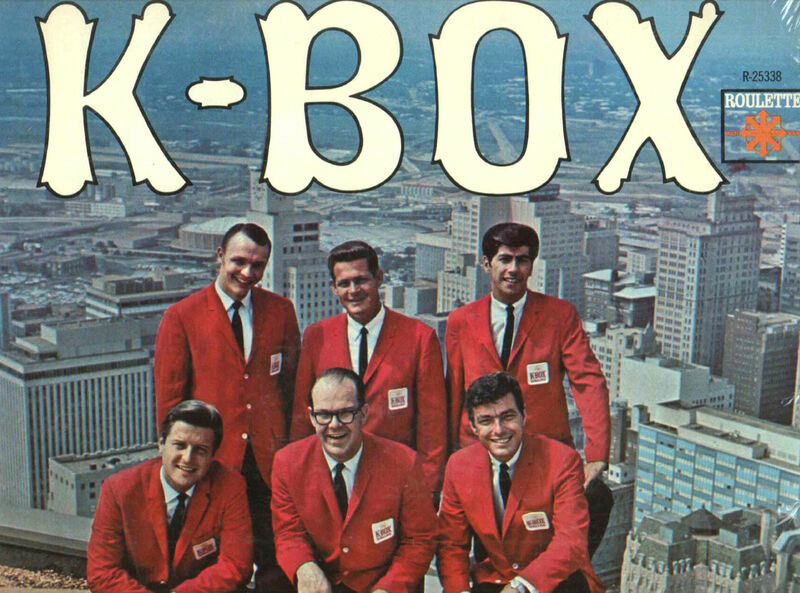 So it’s a bit of a shock to learn that KBOX had been a Top 40 station in the ’50s and ’60s — in fact, it was the major competitor of top-dog KLIF. The photo above was shot atop the Southland Life Building in 1966 and appeared on an LP called “Dusty Discs.” On-air personalities shown are (top row) Terry Byrd, Ron Rice, Frank Jolle/Jolley, (bottom row) Dan Patrick, Bill Ward, and Bill Holley. Top photo/album cover from eBay. Absolutely everything you’d ever want to know about KBOX can be found here (and this is just part two of the history!). Growing up in the Dallas area in the ’60s, listening to these two great radio stations occupied a lot of time. I’m not sure why I remember the day KBOX changed from Pop 40 to Country but it’s something I never forgot. The last song played before the change was Donovan’s Mellow Yellow. The next song was Buck Owen’s I’ve Got a Tiger by the Tail. Switched to KLIF after that. This is the ONLY period of the long life of KBOX that was really a competitive battle for ratings in Dallas, Texas. With the above staff* KBOX for the first time in the history of rock n roll radio out shined its main competitor KLIF in three time periods. The first to achieve rating success at KBOX was Frank Jolley (spelled Jolle) in the April/May Pulse rating of 1965. The next surprise for McLendons’ flagship station was when Both Bill Ward 5:30-9:00AM, Khan Hammon 3PM to 7PM (not pictured) and Frank Jolley 7PM to Midnight trounced KLIF in the OCTOBER PULSE then again in the April./May 1966 Pulse. All other rating periods in Dallas from `1955 (The Beginning ) until sold in the late seventies were dominated by BIG KLIF. Thanks! It’s still hard to believe that it was ever anything other than a country station. I’d like to have been around for Top 40 radio in these early days, but I think that after a while I’d have to turn the radio off, sit down, and depressurize from all that insistent excitement coming out of the radio at me! 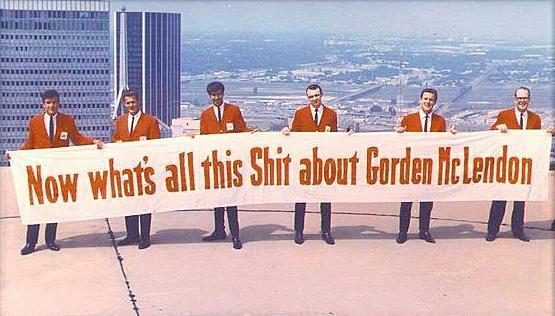 My Dad was Program Director and Morning Drive Time DJ at KBOX in late 60’s, Jack Gardiner. I have some photos from old building and from some promos…. including a photo in my dad’s office with Buck Owens and RCA great Merlin Littlefield…If KBOX played your song in those days, you had a country hit! I always wished we had never moved out of state that was a great time and all our lives so many wonderful people that worked there. I’m glad so many people still think of KBOX. Thanks for the comment, Julia. I bet your dad met a ton of country celebs! Oh, he did. Sad part was I was was not interested in country music at the time as a kid, so I could kick myself now that I didn’t pay more attention to the folks I met in his office, backstage and even in our home…they were ALL very gracious to a little girl I remember…Glen Campbell, Ernest Tubb, Charlie Pride, Porter Wagoner, Connie Smith (my Dad’s not-so-secret crush), Jerry Lee Lewis, Bob Anderson, Minnie Pearl and more. My best memories they were playing Barbie dolls with Dolly Parton before the Dallas Rodeo in her dressing room while my Dad was emcee (she was great fun and so pretty) and saying something as an 8 year old that made Johnny Cash laugh. My mom had worked for Bill Lowery Music in Atlanta as well during day Freddy Weller, Joe South days too. That’s how they met. I only wanted to meet Donny Osmond growing up so my Dad called in favors to make that happen and also to get my brother and myself backstage to meet the Bee Gees one year. He must have thought we were crazy that we were around Country Superstars all the time and didn’t appreciate it until much later. I guess there’s no accounting for children’s tastes…we thought the local Bozo the Clown show was big time then! Julia – do you remember the phone number to the station ? Is this THE Bobby “Wild Child” Brock of K-Box, WFAA radio fame? Would love to obtain copies of those airchecks as I’ve been looking for the circa 63-64 kbox airchecks for years. I’ve got hours of air cks. when I was at box 1963-65.im looking for a reel to reel .i haven’t heard them in the last 50yrs. Thanks for commenting, Frank! If you’ve posted these airchecks — or snippets from them — I’d love to point people in your direction! FOR ALL with airchecks that need to be converted, please let me know. I can do that. George Gimarc / 40+ year radio veteran / Texas Musicians Museum archivist. George@Gimarc.com Still in the DFW area, and still on the air. KBOX lost a living piece of his Rock ‘n Roll history with the passing of Dan Ingram. I grew up north of New York City, and remember very well Ingram’s show on 770 WABC. I have many of his airchecks. They are great to listen to and think about my younger years. Thank you, Dan, for the memories. You are/were a giant and the King of DJs.